Need a blood test? VerySoon you might just be able to use your smartphone to do this. A micro-engineering laboratory at the Swiss Federal Institute of Technology (EPFL) has developed a diagnostic tool that performs blood tests via smartphone screens. The tool allows people undergoing anticoagulant treatments to easily test their blood at home, with the entire process taking mere minutes. Anticoagulants are used to stop blood clots from forming in the arteries and veins. Blocked arteries are serious health risks as they prevent oxygen from reaching certain parts of the body, resulting in strokes, pulmonary embolisms and heart attacks. Those taking anticoagulants need their blood flow monitored regularly, and tests are usually performed in hospitals. The system developed by EPFL’s Qloudlab eliminates the need for routine hospital visits, as test results are produced on smartphone screens. Going to the lab frequently to monitor blood flow can really become a pain in the backside especially for patients who rely on the use of coagulants to limit the formation of blood clots in their veins. 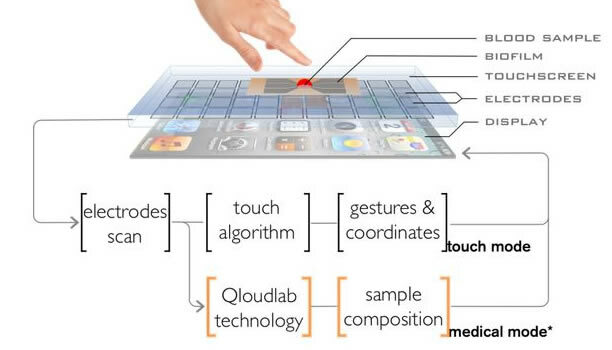 To wage a solution to this problem, a group of researchers at a micro-engineering laboratory at the Swiss Federal Institute of Technology (EPFL) developed a diagnostic tool that performs blood tests through the capacitive touchscreen of smartphones. With the new diagnostic tool, Qloudlab CEO Arthur is hoping that in future, the various challenges associated with having routine blood test by patients taking anticoagulants would be eliminated. The system requires placing a single-use, microstructured plastic layer of film on top of the device’s screen. The newest prototype uses an unmodified Samsung Galaxy S4, however Queval is “confident” the team will make the film workable on other smartphones. Patients place one drop of blood on the film via “capillary action,” which subsequently works with a molecule that causes coagulation. An app on the phone then scans the capacitive field for any disruptions. These changes are analyzed to ensure the patient doesn’t have an an increased risk of bleeding, as anticoagulants thin the blood.